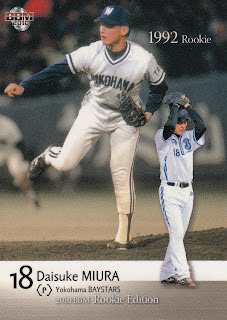 I won't go into too much detail about what cards are available for each of these guys as a simple search using the Inventory Manager at SportsCardForum.com will give you the complete list (thanks Jason!). I don't think any of the six have any Calbee cards, although they have some Konami and Owners League cards. 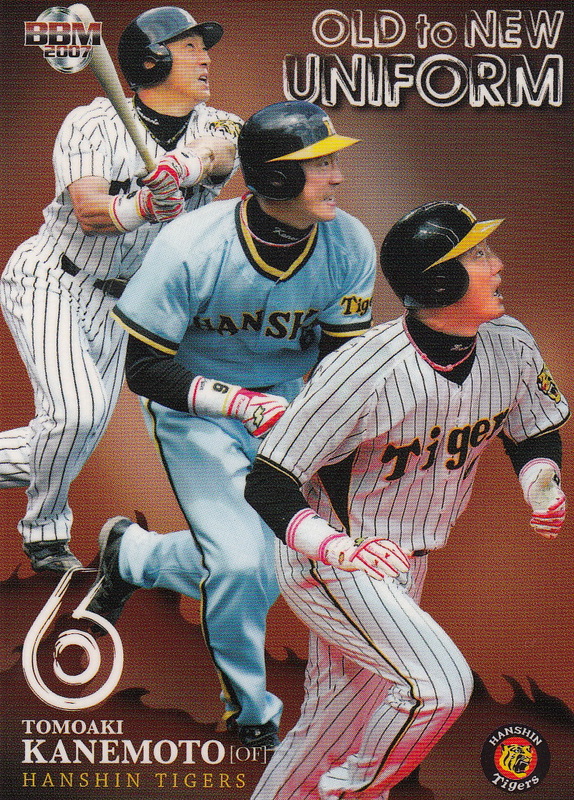 Each of the six appeared in a BBM Rookie Edition set - Nakata and Shiranita in 2008, Nakazaki and Shibata in 2009, Fujihara in 2010 and Koishi in 2012. 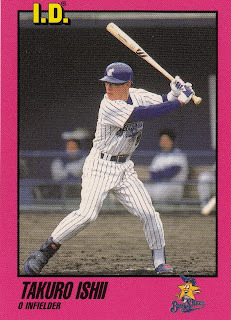 Fujihara, Koishi, Nakazaki and Shiranita appeared in the BBM 1st and 2nd Version sets in their rookie seasons (Nakazaki didn't make the 2nd Version set), but have pretty much only been in their respective team sets in the following seasons. 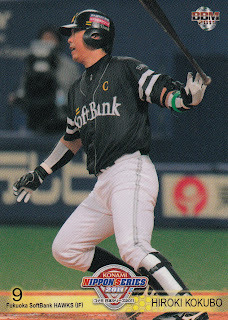 Shibata has appeared in the 1st Version set in 2009, 2010 and 2012 as well as the 2nd Version set in 2012. 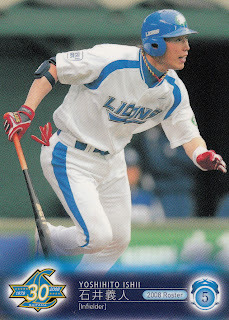 Nakata's only BBM cards (other than his Rookie Edition card) are from the Lions team sets. There's an additional Japanese player on an ABL roster but he's not an NPB player. The Brisbane Bandits have an outfielder named Hirotoshi Onaka who is a minor leaguer in the Texas Ranger organization. 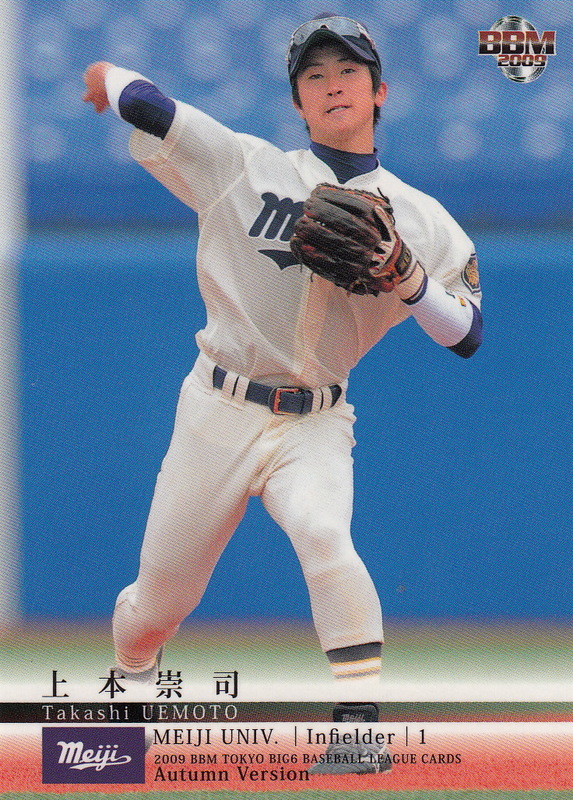 He has never played in NPB but apparently signed with the Rangers out of International Pacific University in Japan. 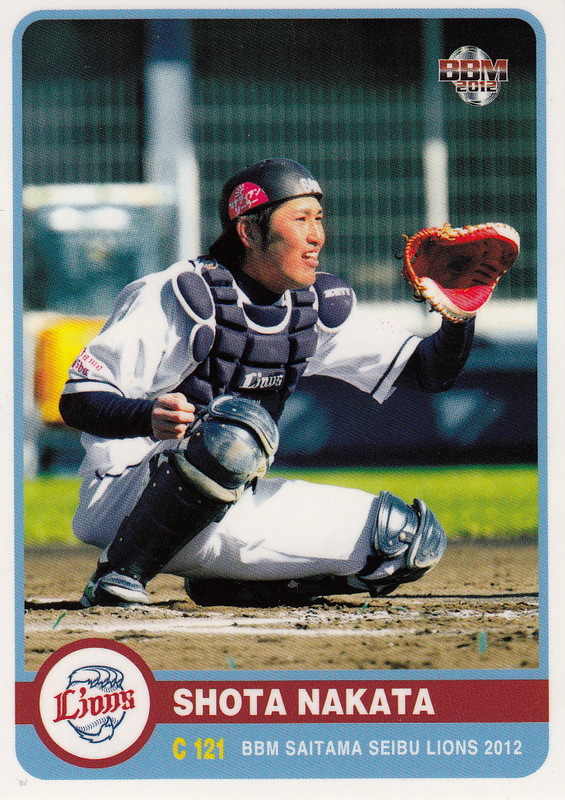 I'm not entirely sure all the rosters are up to date as the Sydney Blue Sox roster still lists 43 year old Korean pitcher Koo Dae-Sung who I thought retired at the end of last season. So there may turn out to be more players than I thought - conversely it may turn out that ALL the rosters are old and these six played LAST season but I'm fairly confident that that's not the case. - BBM announced a couple of new box sets. 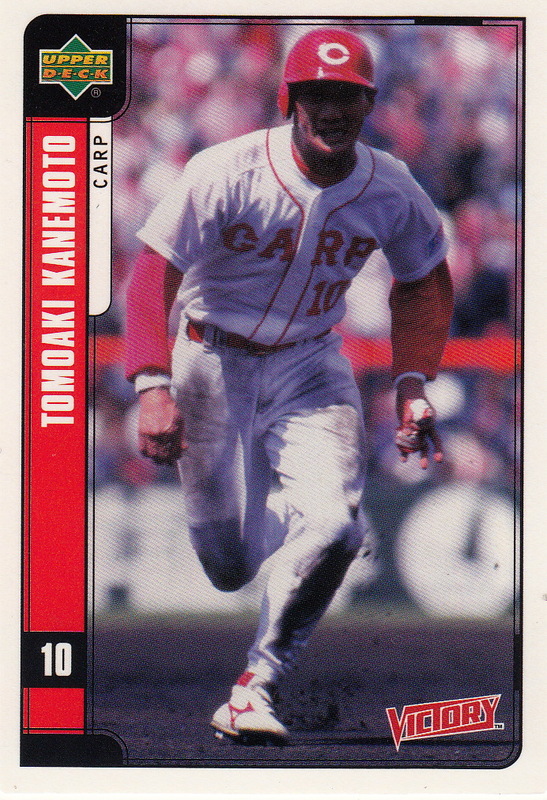 One is a memorial set for Tomoaki Kanemoto containing 28 cards - 27 "regular" and one "special" card - possibly an autograph, bat or jersey card. 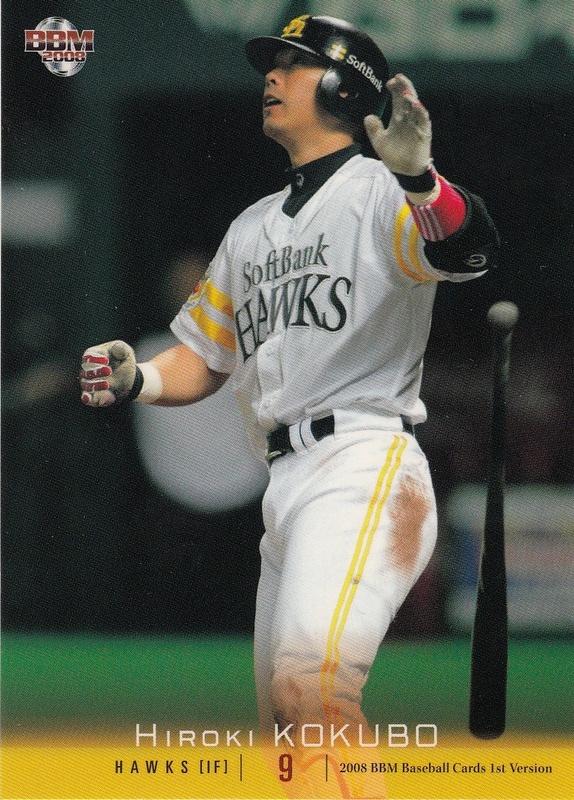 It will be released at the end of November. 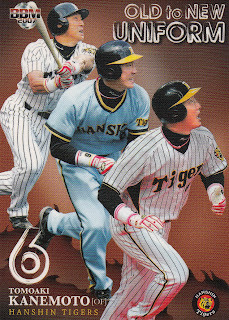 The other new set is the annual Rookie Edition Premium set. 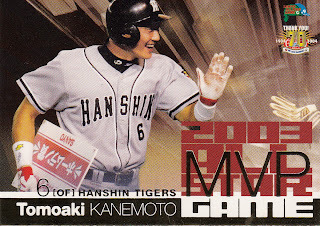 This is a 50 card set featuring 48 "regular" cards and two "special" cards - possible autograph and memorabilia cards. 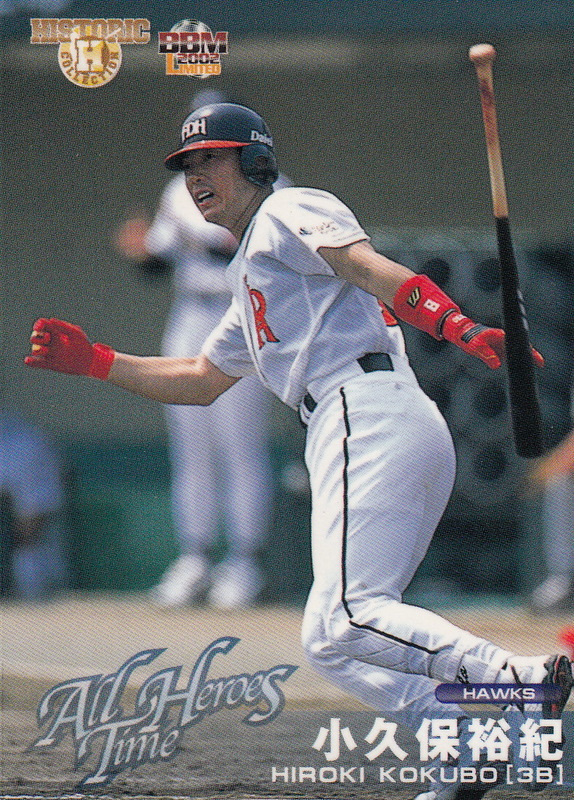 The 48 regular cards break down as 36 rookie cards (3 per team) plus 12 "Rookie's Moments" cards (1 per team). The website says that the set will be out in early November but Jambalaya has the set up on their website already. 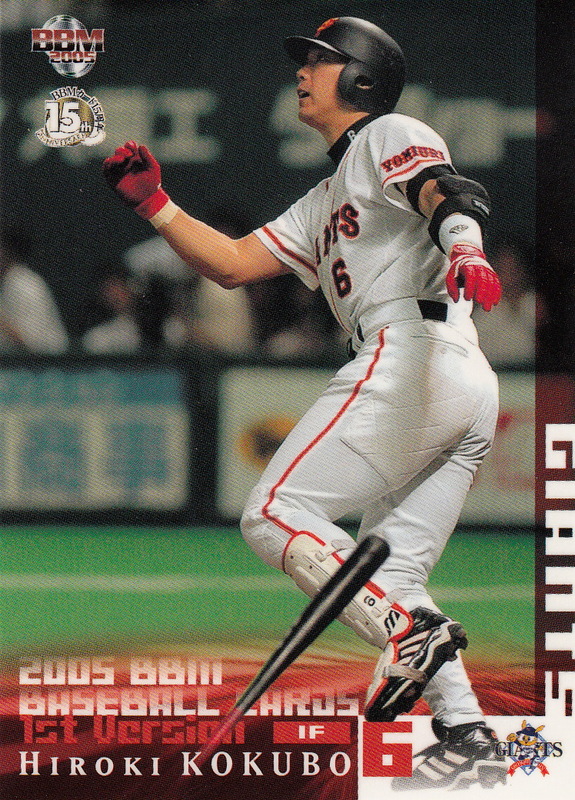 - AmiAmi has announcements of several new sets that haven't shown up on BBM's website yet - a "Rising Carp" box set, and a "Giants Legend" set. 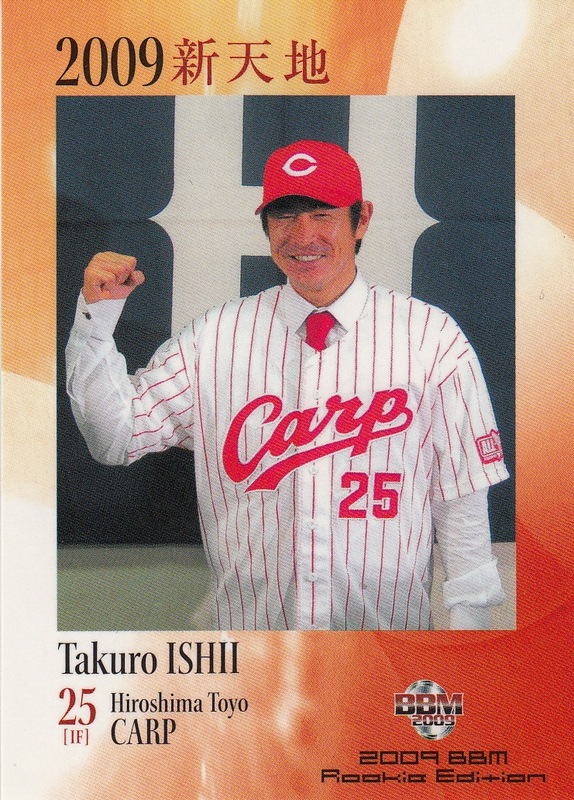 They also have a listing for a box set featuring the Carp produced by Hiroshima Athlete Magazine. 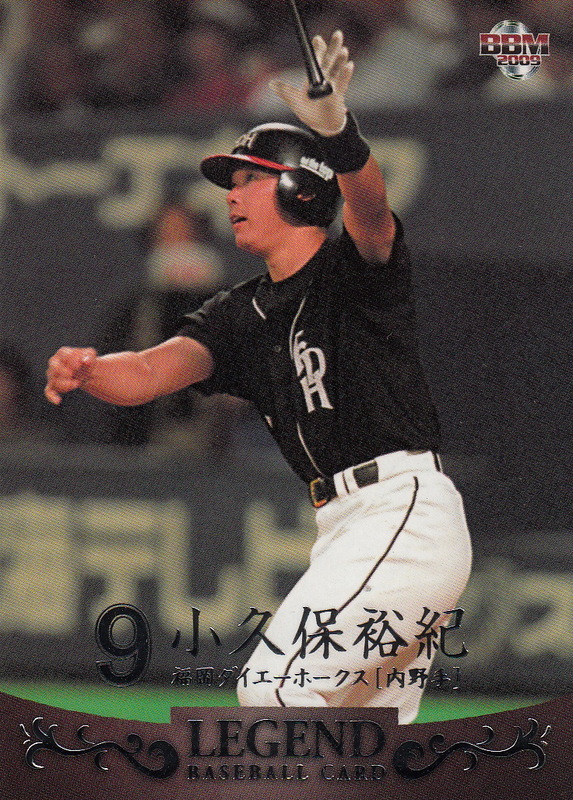 There's also a set out from Number One for Hiroyuki Nakajima. - Ebbets Field Flannels has put out a couple new Japanese baseball items - a 1958 Nankai Hawks hat and a 1966 "Nagoya" Dragons t-shirt. UPDATE - Ebbets Field Flannels is also now selling a 1937 Nagoya jersey. 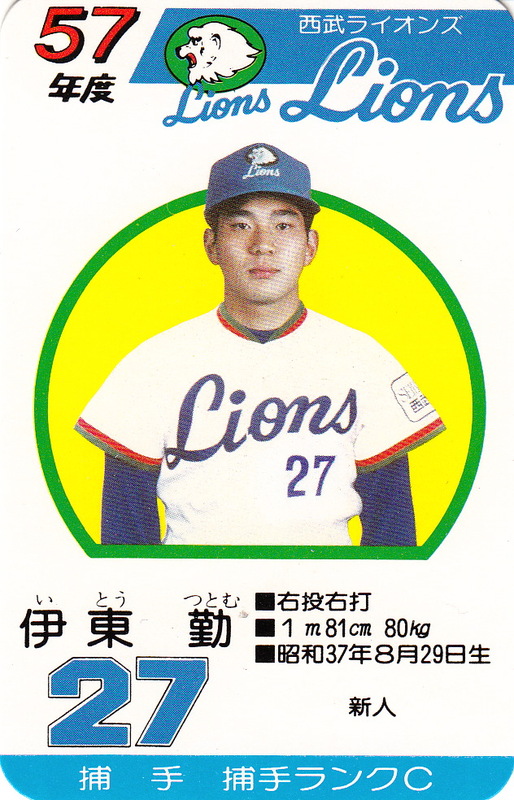 The Chiba Lotte Marines named former Lions catcher and manager Tsutomu Itoh as their new manager a couple of weeks back. 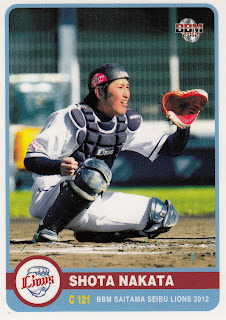 Itoh's one of my favorites (I think I have a soft spot for catchers who play forever - Itoh, Tanishige, Nomura, etc) and this gives me an opportunity to show off a couple of cards of him that I've picked up recently. Today was draft day in Japan and as always, Deanna at Marinerds and Gen at Yakyu Baka were all over it - Deanna apparently staying up all night to cover the action as the draft started at around 1 AM Pacific Time. While all eyes were on Shohei Otani and would anyone draft him despite his announced intention to go directly to the US (only the Fighters), there were a couple Tokyo Big Six players taken so I'll do my annual list of the existing cards for the drafted players. All the sets listed are from BBM. 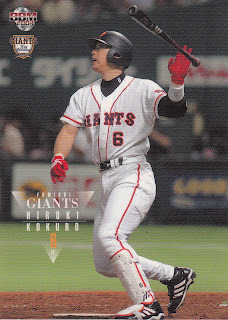 I'm only listing the regular cards here as I don't have a complete list of the insert cards from the Tokyo Big Six sets. 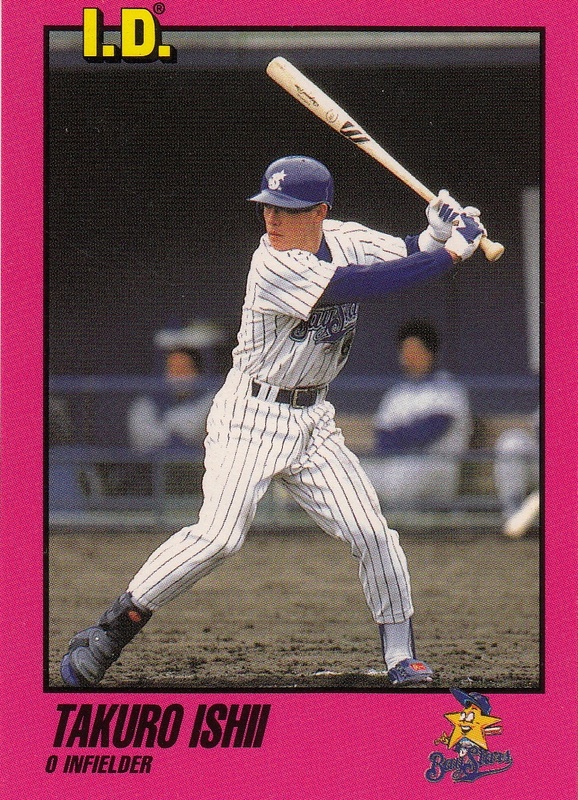 It's possible that there's some former Tokyo Bix Six players who were drafted out of either the independent leagues or the industrial leagues today but I don't recognize anyone off hand. The latest Prestige Collectibles Auction is now online. It will run until November 8. The auction contains the usual selection of really cool (and expensive) stuff. Among other things there's a card of Hall Of Famer Shigeru Sugishita when he was a Meiji University, a card of a very young Katsuya Nomura, a 1967 Kabaya-Leaf Sadaharu Oh card and a couple cards from the very rare 1971 Kabaya "3-D" set - Oh, Tsuneo Horiuchi and Shigeru Takada. That doesn't mean you won't see something that's not on this list on eBay, especially after he signs with an MLB team. 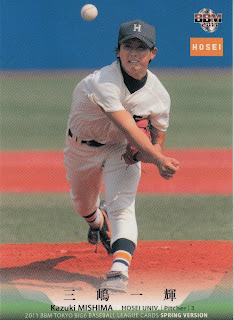 That would be someone's unlicensed, home-brew card. 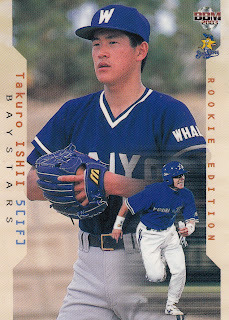 I got to thinking when I was doing a post on Takuro Ishii the other day - how many former Yokohama Taiyo Whales players are still playing? 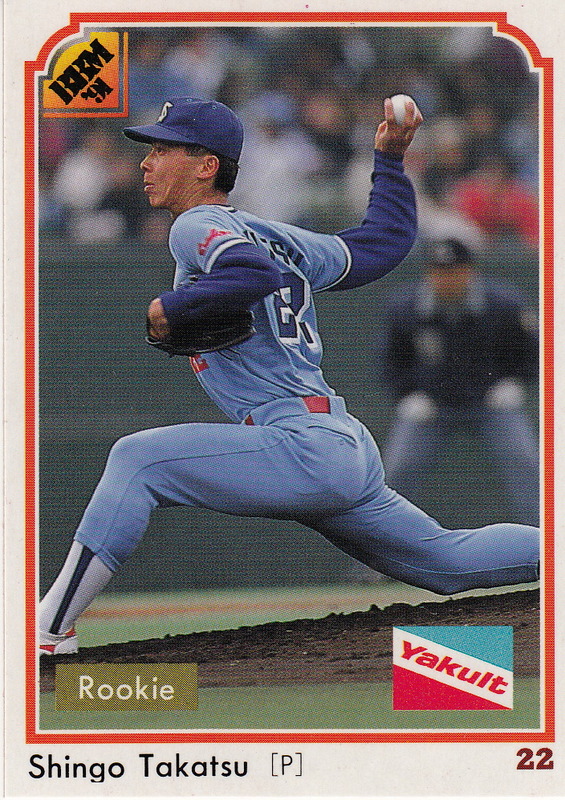 Yokohama changed their name to the BayStars (or Baystars or Bay Stars - never quite got that straight) in 1993. 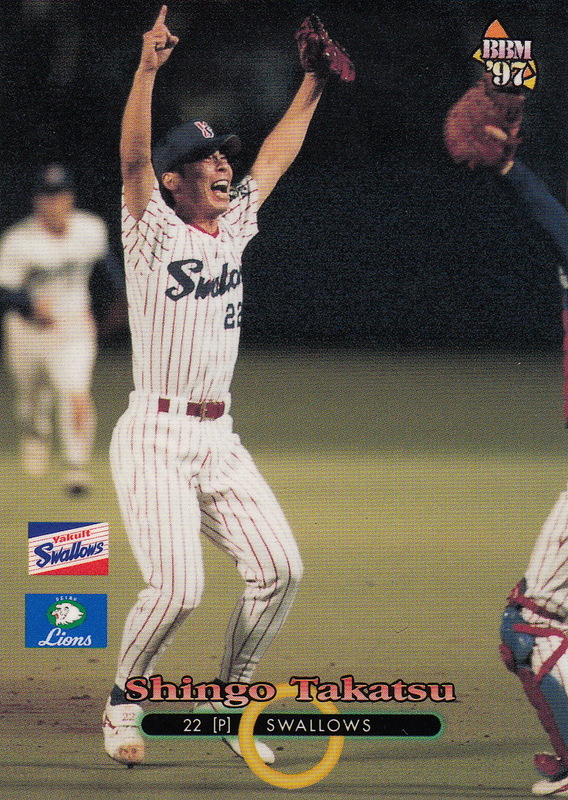 I took a quick look at who appeared on the Whales' final roster in 1992 and it looks like there are three guys still active. Two of them were kind of obvious - Motonobu Tanishige and Takashi Saitoh, but I was surprised to discover that Daisuke Miura made one appearance in 1992 - pitching what looks like two scoreless innings. 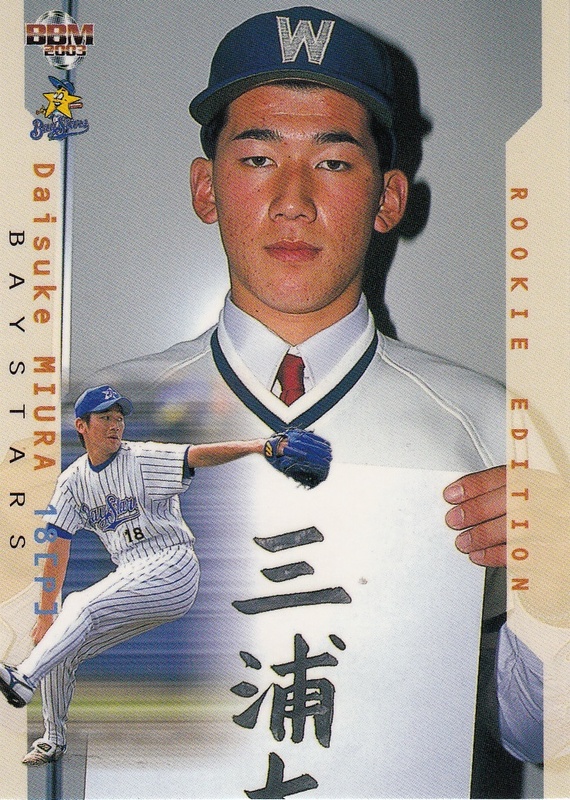 Obviously the 2003 card is from the 1992 draft - oddly enough, his 2007 BBM Draft Story card shows him in a BayStars uniform. So I think there's only the three former Whales players still active - can anyone think of anyone else? The Giants kept the Dragons at bay today by beating them 3-2 on a walk-off hit in the bottom of the ninth by Yoshihito Ishii. 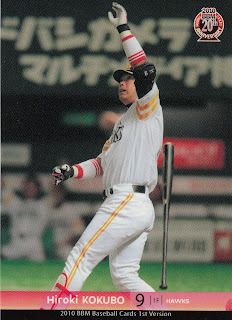 Ishii, who was pinch hitting for Yoshitomo Tani who was pinch hitting for Tetsuya Matsumoto (the Dragons changed pitchers after Tani was announced), hit a bases loaded single to left to win the game. This sets up a winner-take-all playoff final for tomorrow. Like so many others before him, Ishii is an unlikely post season hero. 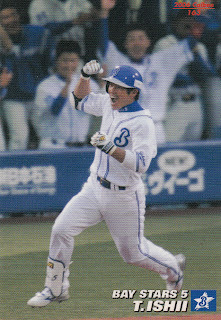 Ishii is a 34 infielder who has previously played for Yokohama and Seibu. He had a few years in the mid-00's as a regular with the Lions - even making the All Star team in 2005 - but he hasn't played a lot at the ichi-gun level the past few seasons. The Lions released him at the end of last season and the Giants picked him. He only appeared in 51 games for the big club this year, although he did hit .315. 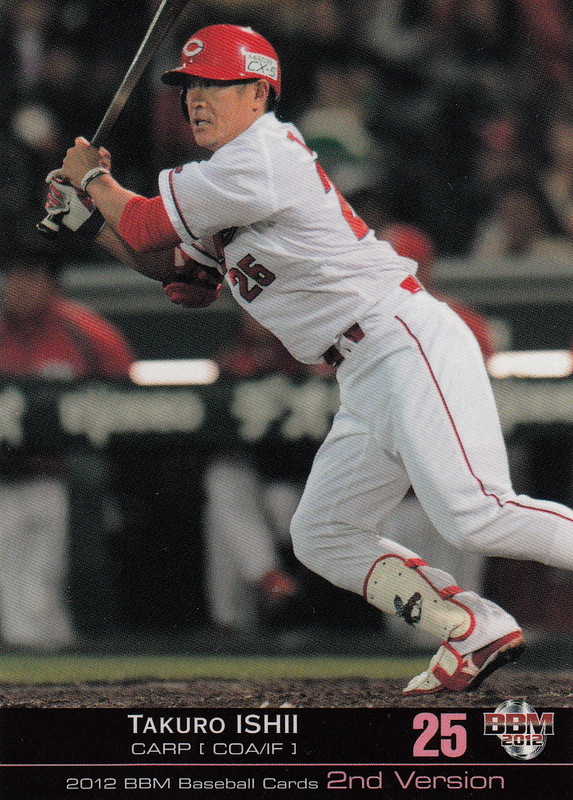 Yet another player who retired at the end of this season was Takuro Ishii of the Hiroshima Toyo Carp. 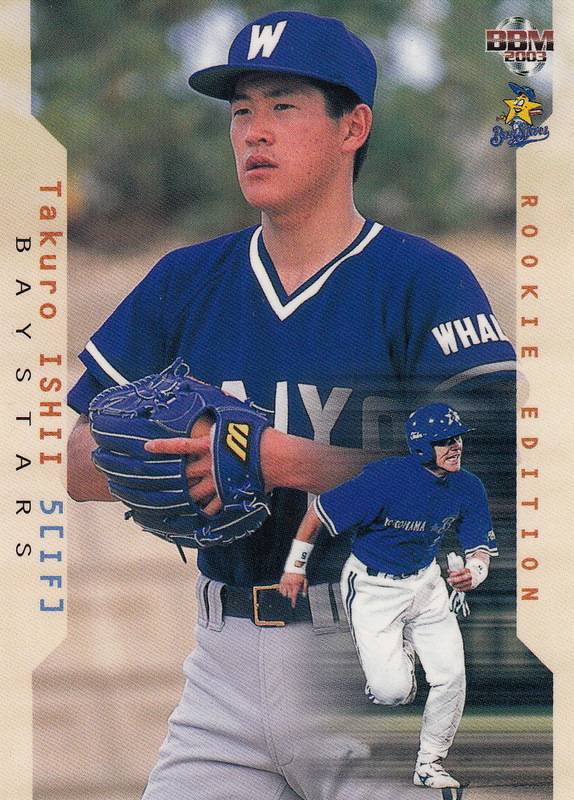 Ishii originally was signed at age 18 by the then Yokohama Taiyo Whales in 1988 as a pitcher (which I've mentioned a couple times before) named Tadanori Ishii. 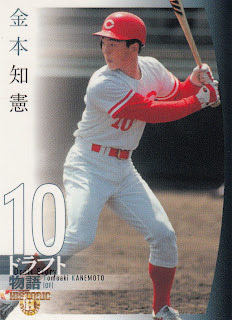 As far as I can tell, the only contemporary card of him as "Tadanori" was in the 1990 Takara Whales set. The pitching thing didn't work that well for him, so in 1992 he became an infielder. 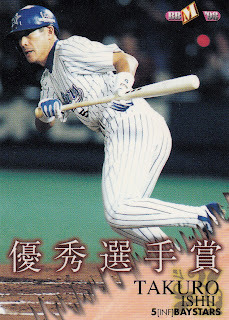 His first cards as a position player came in 1993 with BBM (#362), Tomy (#232) and Takara BayStars (#0). 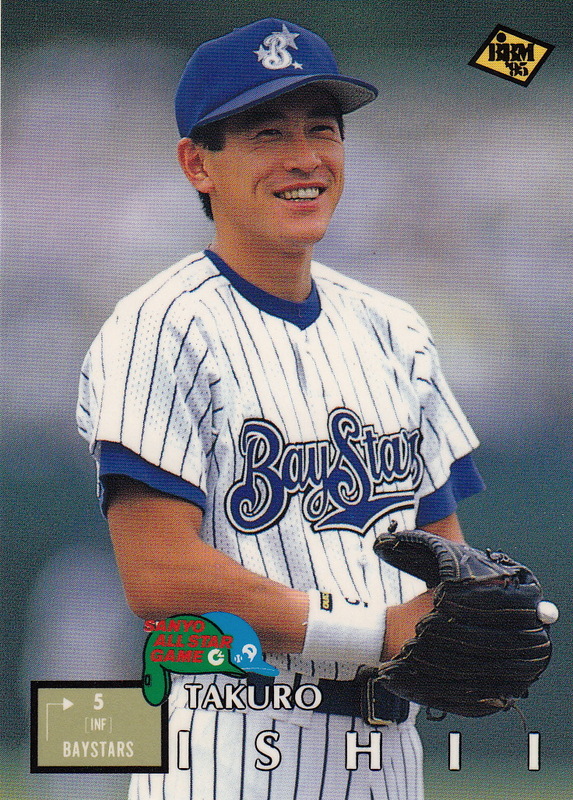 Ishii became a regular in 1993 and quickly became a star. 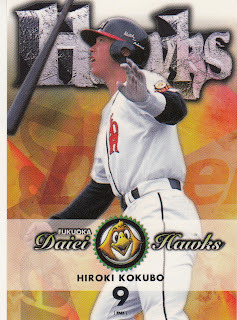 He ended up playing with the BayStars until 2008, getting over 2000 hits for them. 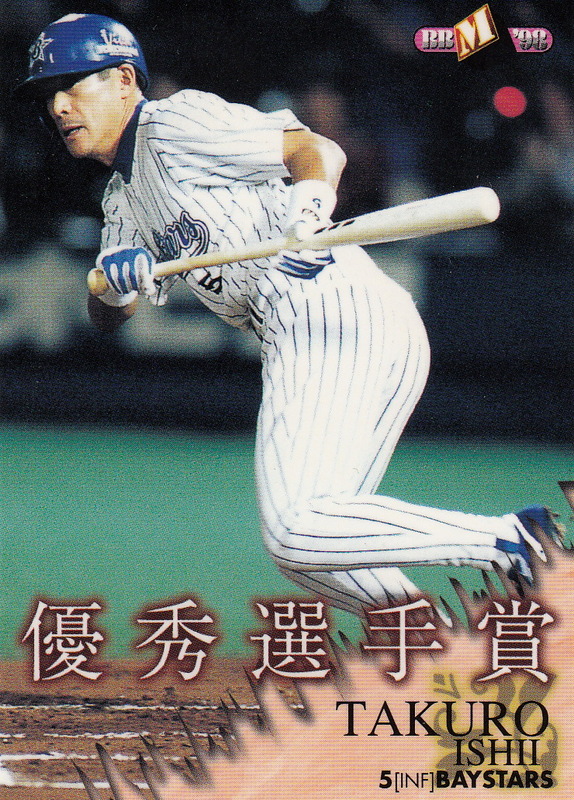 Ishii made six All Star teams during his career - first in 1995 and then five straight years from 1997 to 2001. 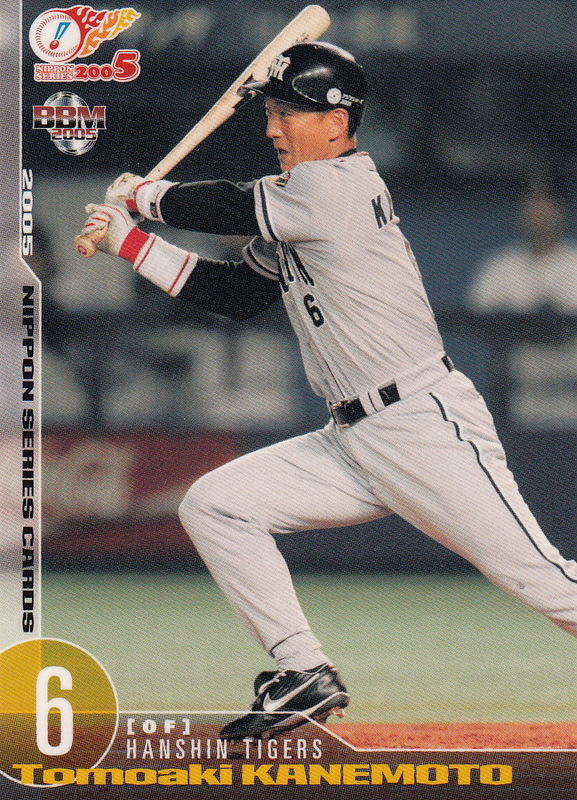 He only played in one Nippon Series during his career (which isn't a surprise considering he played most of his career in Yokohama). 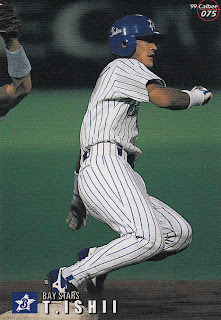 In 1998, Ishii hit .364 as the BayStars defeated the Lions in six games, leading him to win one of the "Outstanding Player" awards. After 20 years with Yokohama, Ishii left the BayStars for Hiroshima after the 2008 season. 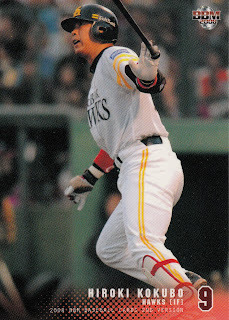 He spent most of the past four seasons as a part-time player and pinch hitter. 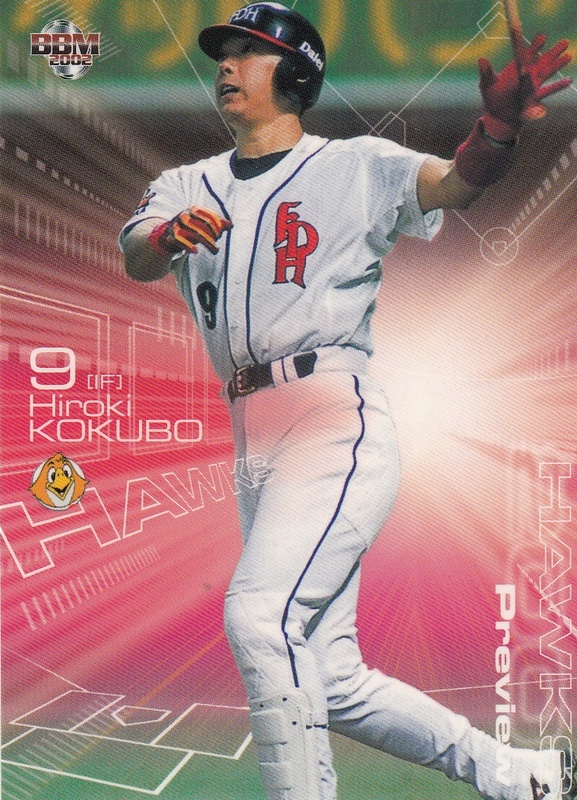 - a box set commemorating Hiroki Kokubo's career. It will be a 28 card set - 27 "regular" cards and 1 special card - possible autograph and/or memorabilia cards are available. 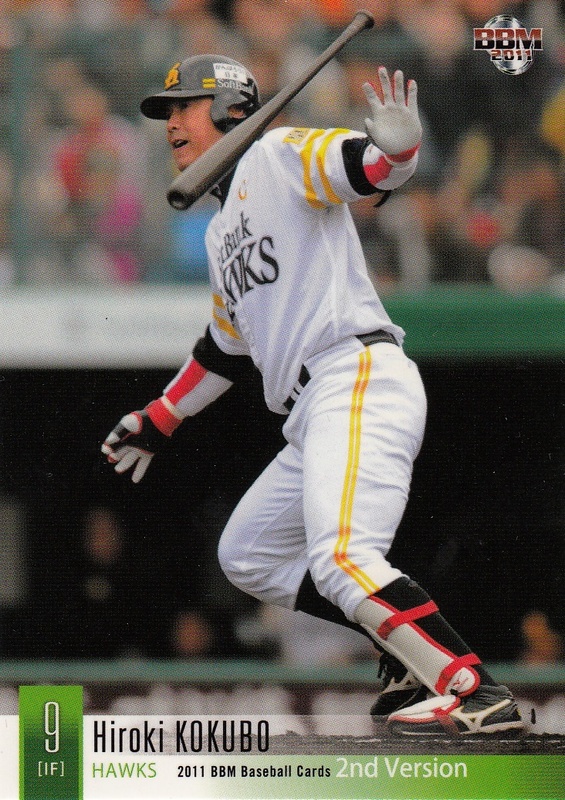 I'd hope that BBM might use some pictures other than ones of Kokubo throwing his bat after his swing, but two of the three sample autograph cards shown on the linked page show that same pose. The set will be released in early November. As an aside, there appears to be another Hiroki Kokubo commemorative pack based set coming out from a company called (I think) Number Athlete that will be coming out shortly. 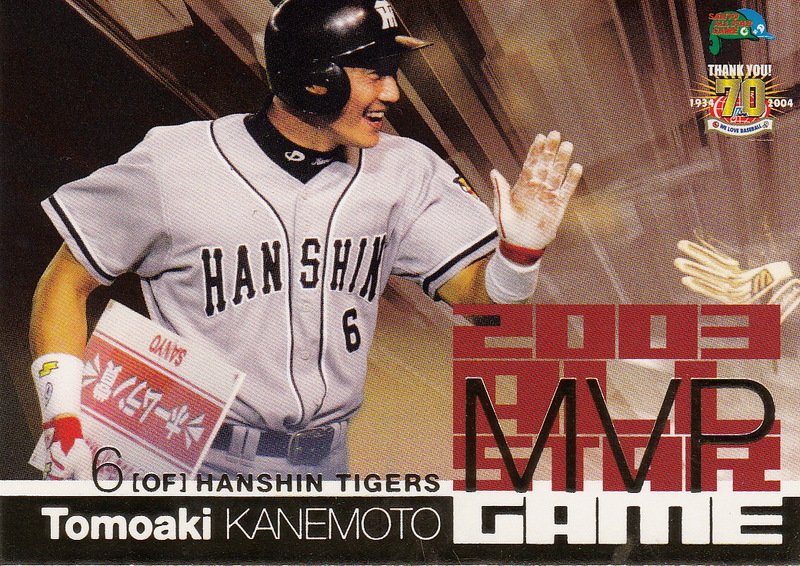 BBM will also be releasing commemorative box sets for both Tomoaki Kanemoto and Takuro Ishii, although no information on these has shown up on their website yet. - the 2013 "Historic Collection" set called something like "Jersey Numbers". 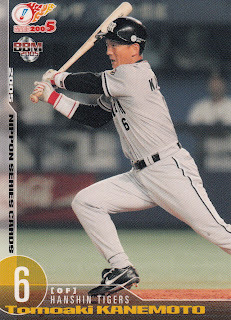 This will be a 144 card pack based set (like the previous 10 "Historic Collection" sets) that will feature current and retired players and highlight their uniform numbers. There are 129 "regular" cards and a 15 card subset for players who have their numbers retired by their teams. 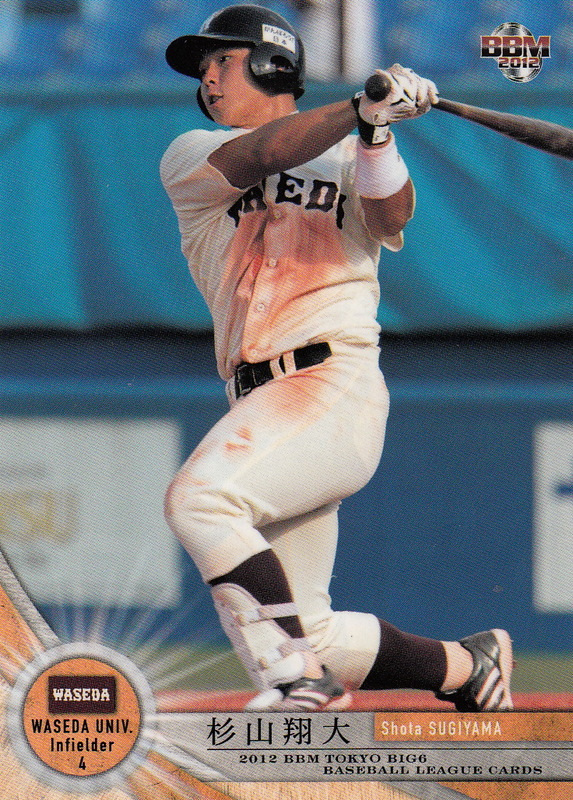 There will be two insert sets - 24 "Great Numbers" cards each featuring two players who share a uniform number and 12 "Photo" cards. There will be also autograph cards available. The set will be released in late November. 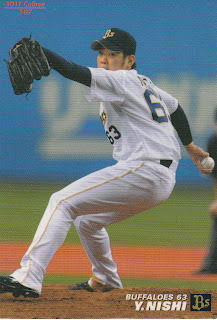 Yuki Nishi of the Orix Buffaloes threw the third no-hitter of the 2012 NPB season last Monday. 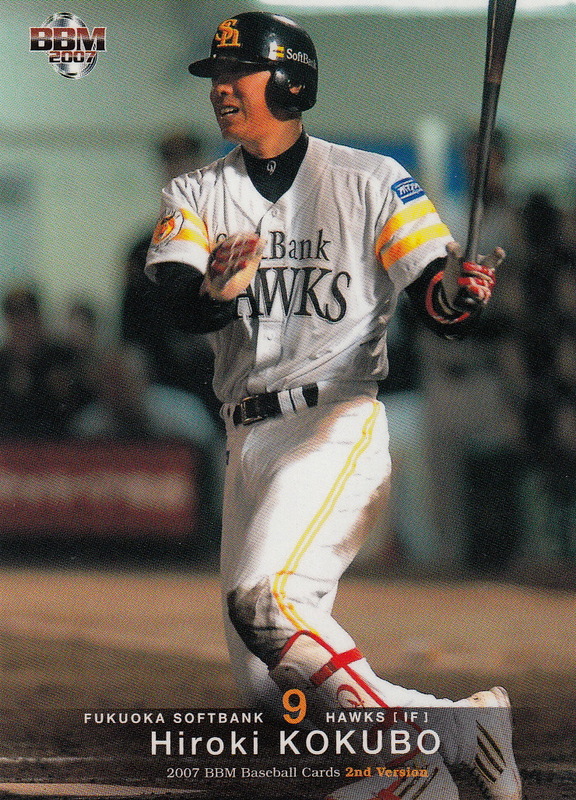 It was the regular season finale for both the Buffaloes and the Fukuoka Softbank Hawks, so it was the final regular season game for Hiroki Kokubo. This was only the second time in Japan that a pitcher threw a no-hitter in his team's last regular season game. 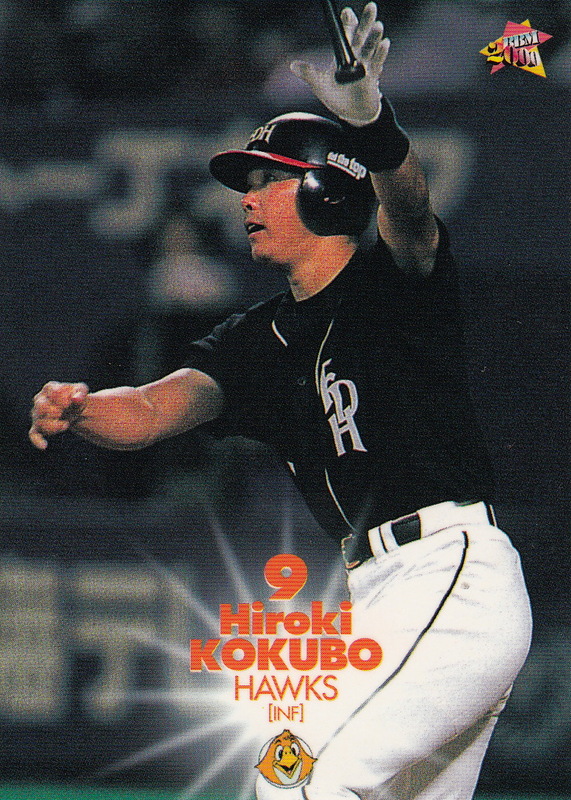 The only other time it happened was in 1937 when Mitsuhiko Ishida of Hankyu turned the trick against the Tokyo Senators. Tomoaki Kanemoto of the Tigers played his final game today at Koshien against the Baystars. I was lucky enough to tune into the game this morning (US East Coast time) just in time to see him hit a single in the sixth inning - the final hit in his career. I've previously done a post for Kanemoto when I did a series of posts on the Top 15 Career Home Run Hitters a few years back, so I won't go into a lot of detail on his career. 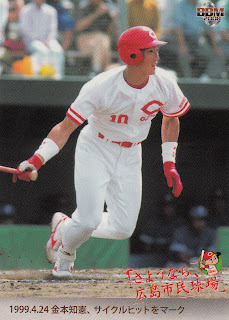 He's best known, of course, for his consecutive game and innings streak - the innings streak is the longest known in professional baseball history (passing even Cal Ripken's) and the game streak was the second longest in Japan (behind Sachio Kinugasa). 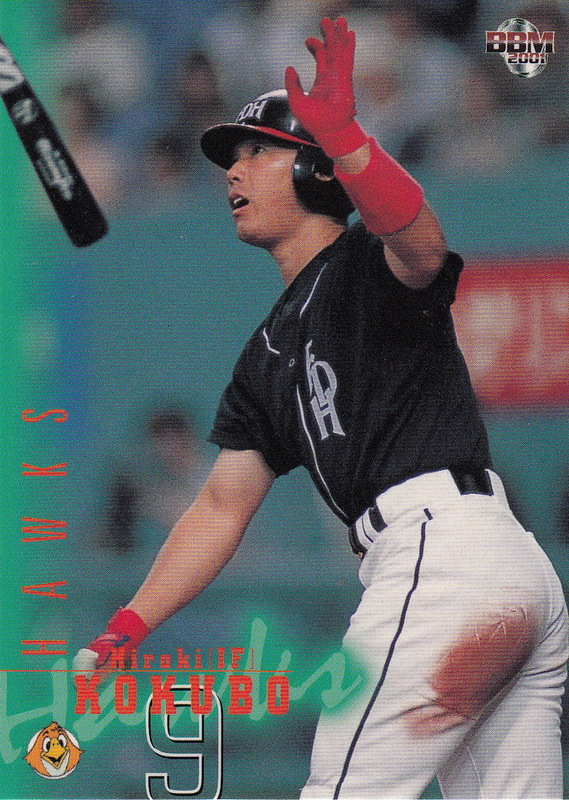 He was drafted by Hiroshima in the fourth round of the 1992 draft (which was a hell of a round as it also included Norihiro Nakamura and Ichiro Suzuki). 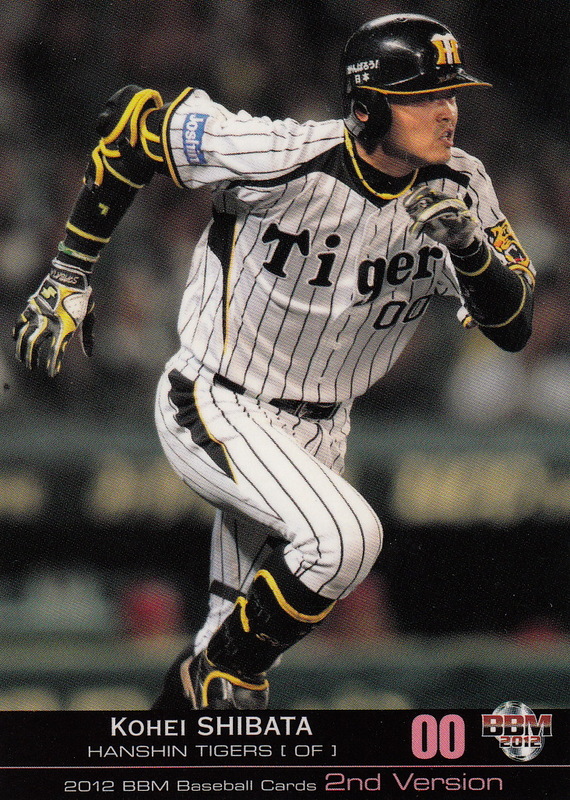 Following the 2002 season, he departed Hiroshima for the Hanshin Tigers. 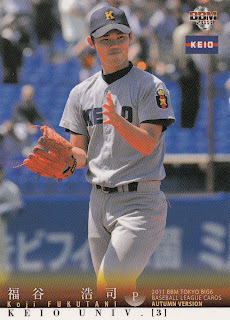 He went to the Nippon Series twice with the Tigers, in 2003 and 2004. Kanemoto made the All Star team 11 times in his career (1995-97, 2000-01, 2003-06, 2008-09). 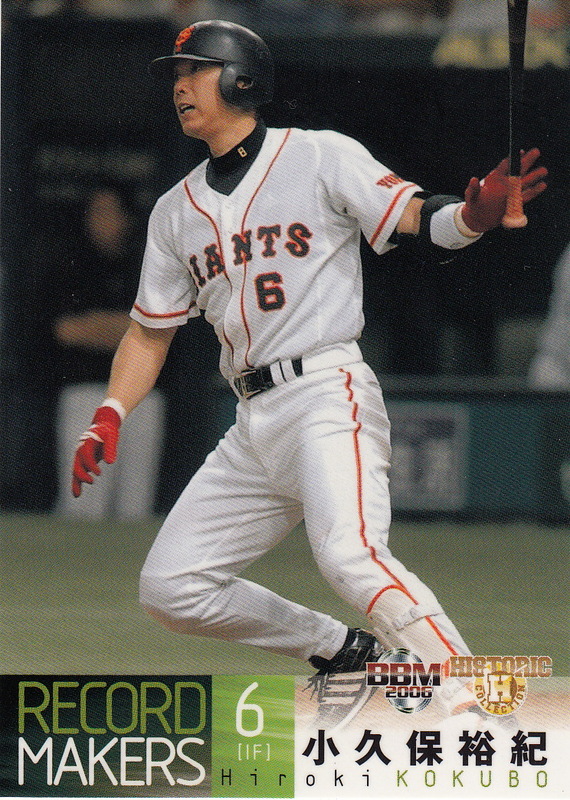 He was MVP of one of the games in 2003. 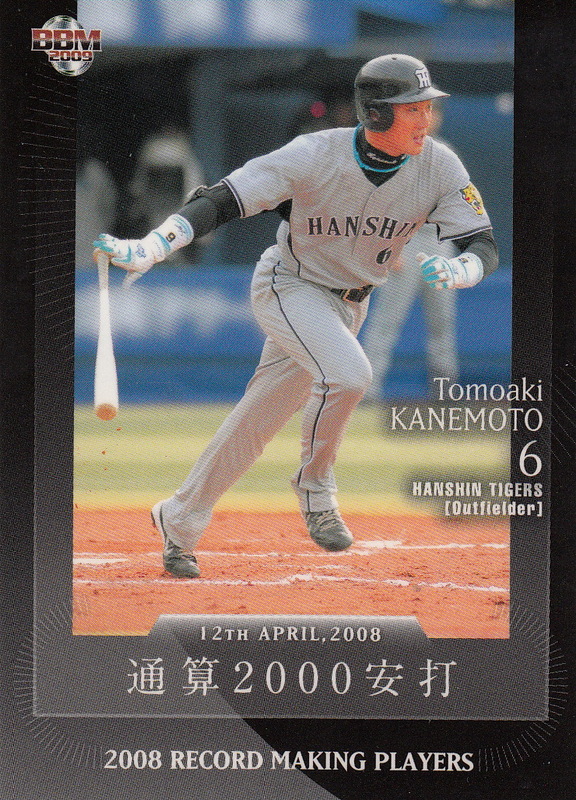 He reached 2000 hits in his career on April , 2008. 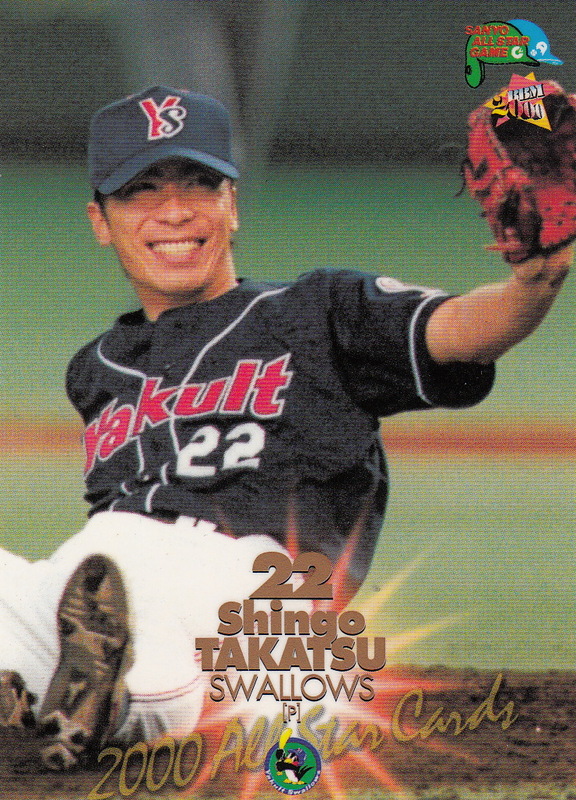 Former Swallows relief pitcher Shingo Takatsu retired a couple of weeks back. 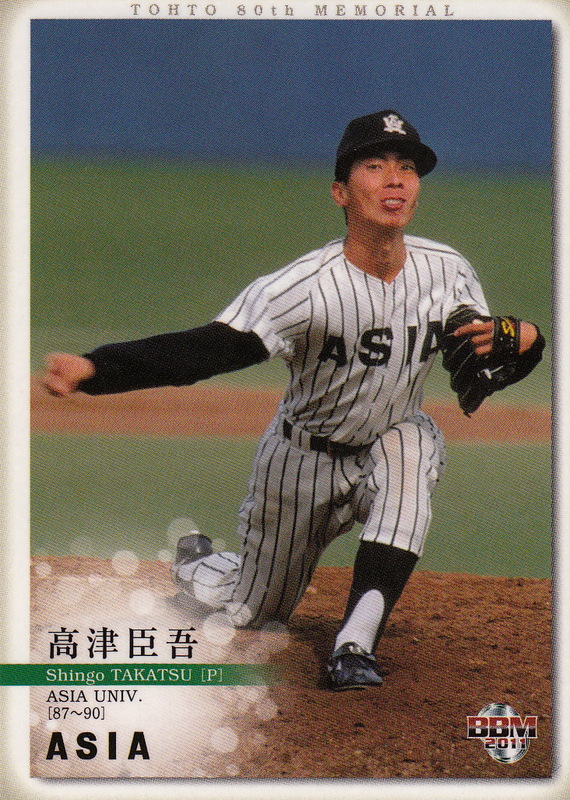 Most recently, Takatsu had been player-manager for the Niigata Albirex of the independent Baseball Challenge (BC) league. 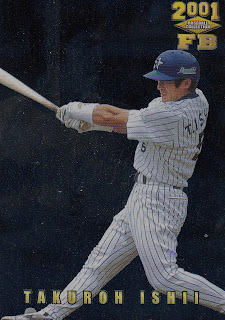 Takatsu had attended Asia University in the late 1980's before being selected by Yakult in the third round of the 1991 draft (which was held in fall of 1990). His BBM rookie card is #387 in the 1991 BBM set. 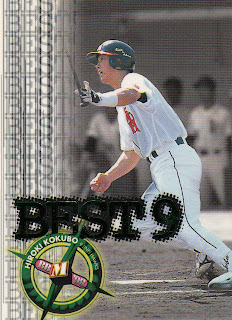 His first Calbee card was not until the 1994 set (#99). Following the 2003 season, he came to the major leagues, signing a deal with the White Sox. 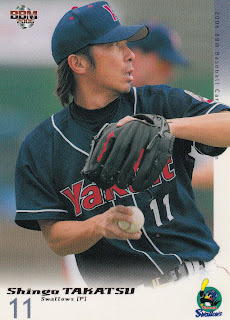 He spent the next two years in the US, pitching quite well for Chicago in 2004 but not so well in 2005. The White Sox ended up releasing him at the beginning of August and he was picked up by the Mets for the remainder of the season. He then returned to Japan for the 2006 and 2007 season, coming back to the Swallows and extending his save record to 286 (which has since been passed by Hitoki Iwase of the Dragons). In 2008, Takatsu attempted to return to the US by signing a deal with the Cubs. He was released in spring training, however, and ended up signing with the Woori Heroes in Korea. He signed with the San Francisco Giants organization in 2009, making 14 appearances with the Triple-A Fresno Grizzlies. 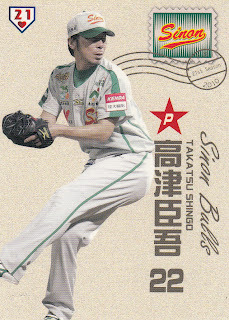 In 2010, he joined the Sinon Bulls of the Chinese Professional Baseball League. 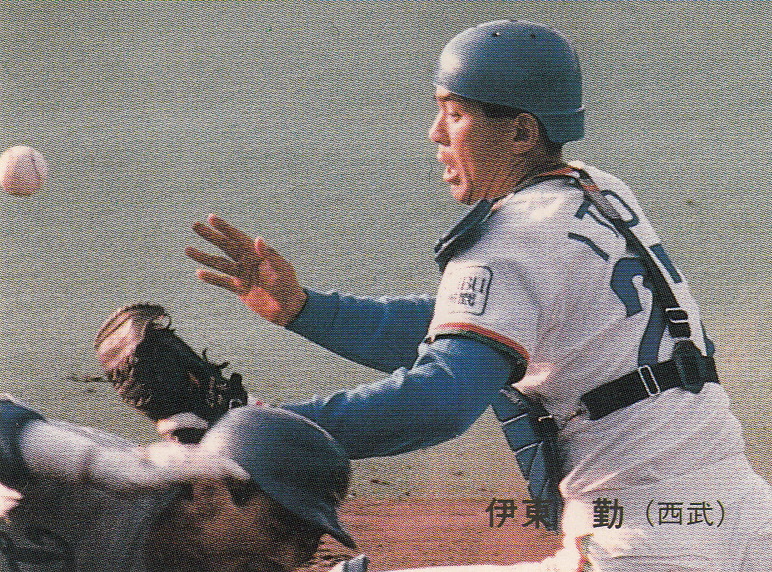 By recording a save with the Bulls, Takatsu became the first pitcher to ever record saves in Japan, Korea, Taiwan and the US. I'm not positive, but I think he spent both 2011 and 2012 with the Niigata Albirex. 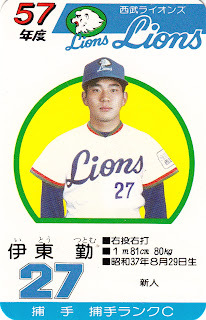 He was only player-manager for the 2012 season. I don't know if he intends to continue as manager next season. 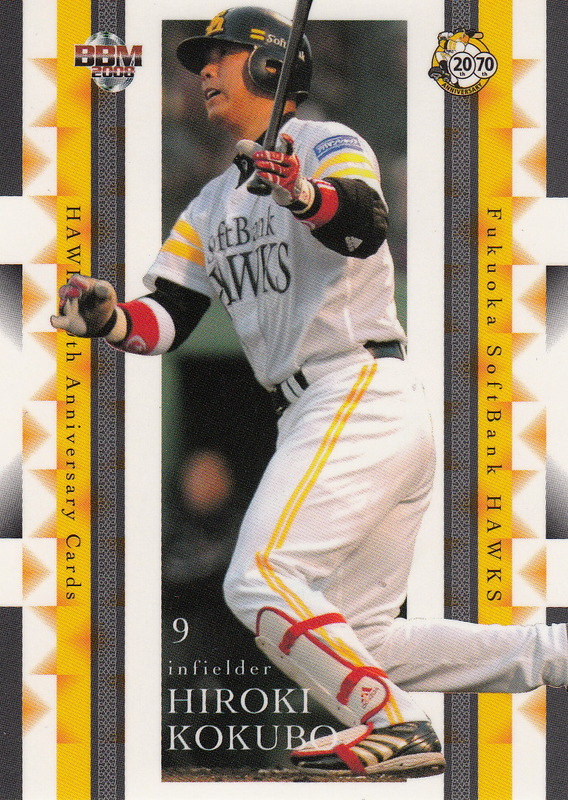 Takatsu made the All Star game six times in his 15 years in Japan - 1994, 1996, 1999, 2000, 2003 and 2007, his final year with the Swallows. 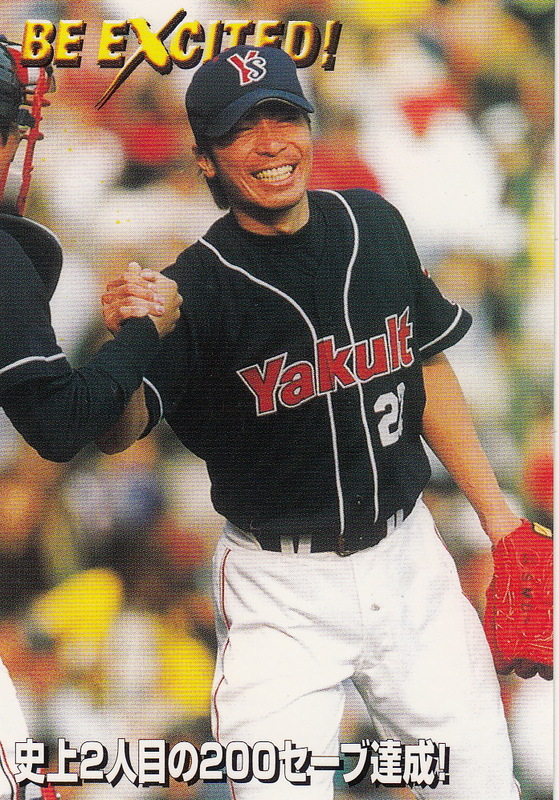 He appeared in four Nippon Series (1993, 1995, 1997 and 2001), winning all four with the Swallows. He earned the nickname "Mr. Zero" by appearing in 11 Nippon Series games (a total of 16 2/3 innings) without giving up a run.